Synopsis: The third installment of the found footage series. When the first V/H/S was released, it did something that no other mainstream horror film had done in recent memory. Instead of one cohesive plot line, it was a anthology of a few shorts strewn together with an interlude of a fourth story. It gave the chance for smaller, indie directors to showcase their stuff and gave the audience a new kind of horror movie for the Halloween season. The first installment had mixed reviews, while the second improved on the flaws of the first and was much more entertaining. 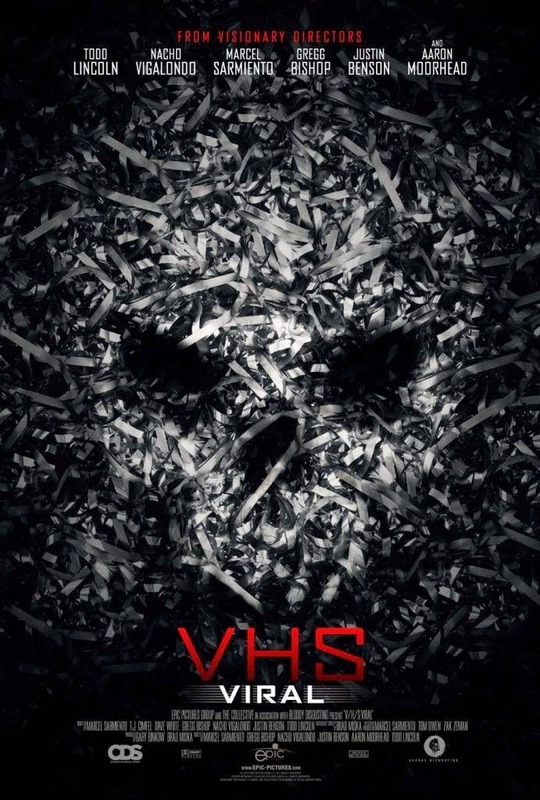 Now, we have the third installment, aptly named V/H/S VIRAL, and unfortunately, the series has completely derailed. There are still three shorts in VIRAL, each with its own themes. However, instead of having a storyline where characters discovery these other stories, like the first two films did, the "wrap around story" is just another short, completely independent of the others, and needlessly chopped up. The filmmakers could have made this the closing short instead of trying to use it to tie all the others together. Also, it seems that the filmmakers completely negated the found footage aspect. A couple of the shorts started off as found footage, but then halfway through, seem to drop it all together and just went with the shakey cam action instead. There was no commitment, either stick with the found footage aspect or do something completely different. The shorts themselves were either a hit or miss. The first deals with a crazy magician with a demon possessed cloak. It was silly, boring, and the two leads looked as if they were told this was a melodrama and came off as severe overacting. The second short was made by Fantastic Fest darling, Nacho Vigalondo. This was the quirkiest of the three. A man opens up a portal into a parallel dimension. The other world, including his counterpart, look almost identical, and he decides to switch with his counterpart for 15 minutes to, of course, disastrous results. Initally, the atmosphere and mystery were great, but then the plot takes a turn into the absurd and never quite recovers. The third short was the strongest of the set, and it follows some high school boys as they go down to Mexico to party and film themselves skateboarding only to run into a cult-like, demon worshipping group. The film is almost entirely shot on Go-Pro cameras, but the editing keeps the tension high and the action moving. It was clearly the strongest of the set. What really makes this film the worst in the series is how in cohesive it feels. The others had at least a story which tied the shorts together. The filmmakers could have easily taken the idea of teenagers wanting to make or find a video to become the next internet sensation. Just a simple story like that could have easily fixed the unevenness in the film. However, this feels like a couple of segments stuck together with no real purpose or follow through. This series has clearly worn out its welcome and should have stopped with the second film.